Are you a member of the travel trade? Experience this unique and close-up exploration of the islands situated on the Upper Zambezi, just above the Victoria Falls. Relax on the boat, enjoying delicious snacks and refreshments, whilst viewing the rising spray from one of the Natural Wonders of the World. This exceptional 5 day safari takes in both Zimbabwe’s and Botswana’s best highlights, evoking all the romantic adventure of the days of discovering Africa’s natural wonders and experiencing its extraordinary wild abundance. 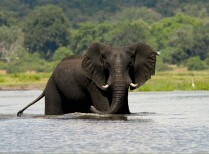 Set off on an exhilarating, full day safari in Chobe National Park. 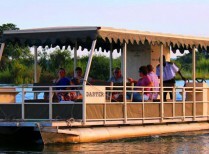 Enjoy a leisurely game-viewing cruise on the Chobe River in the morning. 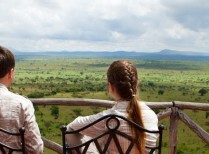 After lunch, you board safari vehicles for an exciting game drive through the park. 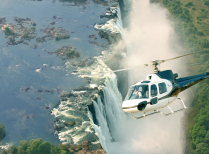 The 13-minute Flight of Angels gives you the unforgettable opportunity to appreciate the extent of the majestic Victoria Falls.